During this Easter Week we encourage you to click on Tom's latest essays above. Also, for other events occurring, the best source for day-to-day commentary are the Fathers Moderator at Traditio below. As these pages load, we invite you to say as many Hail Mary's as necessary. You can click on the Rosary button to the left as well. We pray you will be imbued by the truths of the authentic Catholic Faith we provide here and yearn to learn more of the infrangible truths of the only Church founded by Jesus Christ. For Easter Sunday we bring you Father Louis Campbell's brief sermon first given three years ago. Father reminds us emphatically that we can only truly celebrate Christ's Resurrection if we accept and believe, as every Catholic must, that we are already dead to this world. Realizing this, we have no fear of what man will do to us for neither War, Strife, Famine or Pestilence can harm the soul. But those who value the world, the flesh and the devil have much to fear for the Four Horsemen of the Apocalypse have already begun their gallop over this earth. Father encourages us to take comfort in Christ's victory over death and sin, to be consoled by the optimism of the Exultet which illustrates so well the fact that the darkness is obliterated by the Light of Christ - the Light of Truth which cannot be suppressed. Christ's Rays are forever to those who choose to bask in His graces for He is risen as He said. Alleluia! "The will of God - your sanctification"
Fr. Martin Stepanich OFM, S.T.D. Fr. Martin Stepanich, OFM S.T.D. Conversion through Charity and Kindness, never by Compromise! "With what measure you measure"
"Though the earth be shaken"
Litany of January Saints The ides of January bridge Epiphany and Septuagesima. Heads up, all ye sedes, not one grain of incense i.e. no conciliar concessions. Period! Who is left to oppose the Ecumaniacs? Showing Libertarianism's True Biases They're touting the wrong lady. On behalf of The Daily Catholic's excellent array of contributing writers, who have provided so much insight and inspiration in helping all learn more about their Faith in order to know what we must all do to preserve and uphold the One True Faith of Apostolic Tradition, we want to extend to all our readers a blessed and grace-filled Easter and may you bask in the Mystical Light of our Resurrected Savior and grow stronger in your Faith throughout this time of Paschaltide. Alleluia, alleluia. Believing takes faith, Faith in founded on belief in all the Son of God imparted to man through the only Church He founded. Believe it! Why would the Jews ever have looked a gift horse in the mouth and said 'no'? That is a question for the ages. Will we cave to temporal trivials like the original children of Abraham did or be true to Christ as the spiritual children of Abraham? How will we ever repay Christ for the Ransom He paid for us? We can't, but He doesn't expect anything more than to love Him and obey all He taught and passed down through His holy Church. Thanks to Traditional Catholic Sermons, we're able to bring you audio reflections/sermons during Holy Week, all by His Excellency Bishop Donald Sanborn. Since Holy Week is such a solemn time when we must focus on the spiritual and walk with our Lord the Way of Calvary, the meditative talks by Bishop Sanborn provide an excellent opportunity to join more fully with Christ and make Holy Week truly a holy time. We have provided above the links to the three most solemn days, known as the Sacred Triduum with all the Propers pertinent for the day in both Latin and English so, if you do not have a Traditional chapel you can get to that offers the Holy Sacrifice of the Mass and all the rubrics of this week, you have the next best thing in observing this most solemn time and be prepared to truly celebrate the Resurrection of the Lord either at the Gloria at midnight leading into Easter Sunday or the following morning. It seems every non-profit wants a piece of the pie. But what is the real goal of many? To stay in business by setting a high budget that includes a comfortable built-in salary for executive directors and other salaried personnel, or to do what Christ asked His disciples to do in spreading the Faith in trusting in His Providence to receive just rumuneration for their labors? The latter obviously, and that's where the lambs are separated from the goats, where a widow's mite is appreciated because it came from the heart. Wouldn't it be refreshing if the media, specifically the BBC, announced "and now for something completely different" and then told the truth?!! Do we have the passion to undertake Passion Week with all the fervor possible? Reading Dom Prosper's words should fire us up to give it our all! The Lasting Impressions tatooed on the minds of millions is that the counterfeit church of conciliarism is Catholic because it calls itself Catholic. If one truly knows their Faith they will realize instantly that it can't possibly be Catholic! The comparisons between the High Priests of Christ's time with the conciliar cabal of our time is uncanny as the Modernist high priests go about doing what they darn well please with no respect for what was handed down from Him Who, before Abraham, is Ego sum. Instead they cave to the very men Christ remonstrated. The benchmark for knowledge was provided by St. Thomas Aquinas with his Summa Theologica, which he intended to be the sum of all known learning, arranged according to the best method, and subordinate to the dictates of holy Mother Church. The way of the Cross runs both ways. Either we are wending our way towards Calvary or the pull of the world, the flesh and the devil draws us down and out of the protective shadow of the Cross. Since there have been no good fruits - nada, none, zilch, zero - from the counterfeit church of conciliarism, why should we expect that to change. A bad fruit is a bad fruit, sour and poisonous at that. Be forewarned. Any gardner worth their salt knows you must tend to the garden with care in order to harvest good fruit and take great care not to bruise the fruit. So also with souls in praying for the grace to ripen their hearts and utilizing the best way of discernment in separating the true wheat from the conciliar chaff in order to save as many souls as possible from the fire. In medio jej�nii nostri we pause and rejoice for a day for we have reached the half-way point in Lent and can take joy that we have stayed the course. Today, take time to recollect and recommit to make this the most fruitful Lent ever so that we can truly rejoice. "Unless ye take up thy cross and follow Me daily, ye canst be My disciple." Do we take our Lord seriously on this or not? To combat the outrages, sacrileges and indifference against the Sacred and Immaculate Hearts today that so attack the true Faith, we must fashion from the fire of Faith the sword of truth wielded with unyielding zeal for the Freedom and Exaltation of Christ's true Church. With few willing to fight for the "Freedom and Exaltation of holy Mother Church" today, Cyndi Cain recommends a saint who dedicated his life to this and who exhibited the holy zeal necessary to carry this out and save souls so lost in the darkness of sin. Why is there so much darkness today? We all know the answer to that. It's because the Light is not recognized in the darkness as St. John verified in the first chapter of his Gospel. How do we help reverse that? Through our zeal for souls in spreading the Faith Christ commanded us to spread. But we can't do that if we ourselves are not on fire with authentic Catholic zeal the likes of men like St. Anselm, the holy Doctor of the Church who let nothing deter him from his mission for God in upholding the Freedom and Exaltation of holy Mother Church. This learned saint used every ounce of his being to bring our Lord to souls, defending the Faith despite the odds, going against earthly kings in order to uphold the King of kings. Why then today are there no Anselms to guide us in the darkness, especially in this black hole of The Great Apostasy? Because we have lost that love of zeal for souls, falling into complacency and indifference while the world falls deeper into darkness. With so few lights to light the way toward Truth, hope wanes. How will God judge us when He asks what we did to enlighten the world to the Light of the world, to fight for the Freedom and Exaltation of the Church? If we do not develop true zeal, we'll have no answer for the Supreme Judge when it counts the most as to our eternal destiny. Cyndi offers some tips to help all realize this in her lesson, Do we have the Zeal to Persevere? It's a jungle out there and the SSPX is dangerously close to being engulfed in the stifling, choking vines of Vatican II. 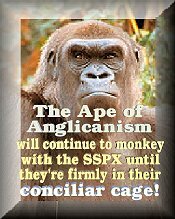 The Ape of Anglicanism is hunting them down for there is a gorilla in their midst whose name is Ratzinger. The Mystical Body of Christ has been beaten, pummeled and mocked with cruel thorns beyond recognition today, but we know the spotless Bride remains infrangible while hying to the catacombs to escape the nip and tuck doctors of apostasy who have incurred the wrath of Almighty God by foisting on so many the "abomination of desolation." Resurrecting a series that first appeared on these pages six years ago, editor Michael Cain continues his series on the analogy of the Mystical Body of Christ with the Sorrowful Mysteries. This week he focuses on the Third Sorrowful Mystery - the Crowning with Thorns - and how it correlates with the Novus Ordo Seclorum Mess concocted by Giovanni Montini and his non-Catholic henchmen and how this ignominous humiliation of the Body of Christ is so pummeled by that sacrilegious, scandalous and Protestant/Masonic/Talmudic service that poses as a "Mass." Cain shows clearly how it is eerily closer to the blasphemous Masonic Mass than the Traditional Latin Mass. And the Motu isn't even close to replicating the latter. He proves this by exposing the elements of a Masonic Mass so the reader can see without a shadow of a doubt that the conciliar concessions are patterned on a mockery of all that is holy. He exposes the two-faced Janus that Ratzinger has always shown as when as a 'cardinal' he said "The New Mass is the real destruction of the Roman Rite!" and yet, today, has done all he can to enthrone it as the main one while tossing a crumb to traditionalists as long as the Recognize-and-Resisters keep their part of the 'Bargain' and annihilate the reputation of those pesky Sedevacantists who know the real Ratzinger. For BeneRatz such a hit job is necessary to wipe out any opposition to his One World religion. Cain pulls no punches in A Thorny Problem that Needs to be Cleared Up. Practice makes perfect and that is why, in her wisdom, holy Mother Church repeats the exercises of Lent every year. Eventually we'll get it right! Beelzebub's greatest accomplishment has been to convince people he doesn't exist. Oh how we have been hoodwinked and, had we listened to the Word, we would be prepared today for the demons' onslaught. As St. Paul urges us in his Epistle to guard our appetites and St. Luke depicts in today's Gospel, we must be on guard against the devil for if we are not careful another seven times worse will enter and shackle us even deeper in sin. The first Doctor of the Church to be made a cardinal, St. Peter Damian had much to do in ecclesiastical reform, including weeding out the antipopes during the Dark Ages. Where, oh where, are the St. Peter Damians in our dark ages today? In the midst of the Church today the saints are still there interceding for the remnant in the catacombs to pray and heed what was passed down by the Doctors of the Church to bring the True Faith out of the darkness of The Great Apostasy. He was bloodied and scourged for our iniquities as the Prophet Isaias foretold. We can help lessen the sting by mortifying our senses, especially during Lent. Upon the foundation of the Rock is based all the truths of Christ's teachings for all times in the New Covenant because the divine mandate for the salvation of every soul, bar none, was entrusted to Simon BarJona and his successors. Among many of the talents attributed to the refined Ratzinger, one might add "vaticantriloquist" because what's coming out of his dummies' mouths originated with the suit-and-tie Hegelian way back in the sixties. God has a reason why He enabled mendicant orders to be formed for without them we'd be too busy, to complacent to pray. Editor Michael Cain has taken the Latin Verbum and Quotidianum, which mean respectively "Word" and "Daily", and coined the word "VerbumQUO" for the title of this series by contracting quotidianum to quo and running it together as Verbumquo; thus the "Daily Word", as in the sum of the message, the 'quotient', if you will. This is intended to identify one key word and sum up that word to help the faithful focus on the message Holy Mother Church conveys so the faithful can better understand the magnificent correlation of Sacred Scripture in the Daily Proper of the Mass. It is also our hope that in choosing the Latin word with its meaning and etimology more will be attuned to hearing Latin read at the altar and better comprehend the beauty of the Mother tongue. The VerbumQUO today is mendicus, which is the Latin for "beggar", who is a mendicant and it is taken from today's Gospel in which our Lord describes the plight of the rich man and the beggar and we see it is better to choose the life of the beggar for the sake of salvation. Cain explains in Traditional Catholic "beggars" can't afford to be choosy! Two men walk into a synogogue. One converts the Jews to the truth by instilling the Fear of the Lord in them, the other prays their prayers, panders and dialogs ad nauseum, conceding whatever the world wants for the times to patronize man, then backpeddles from that, placating no one at all. Which man was pleasing to God? Duh!